Hello all. Busy busy week for me as Chinese New Year came closer and closer. Lots of spring cleaning, shopping and preparation to do. Today I want to share about my mini album project (part 2 assignment) for My Little Shoebox this month. 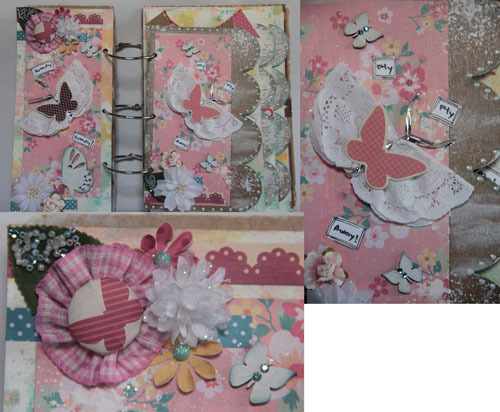 I made this mixed media album with the Secret Garden collection and some from Sew Cute collection. This album is by Punky Sprouts. I love their album and I tend to want to keep them in their raw look without covering too much of it. This album is dedicated to my favourite icons, images that I loved and used often. Also included my favourite colour combos, mixed media techniques. For the front cover, I tore out to reveal the corrugated part of the board. Then I adhered the paper over it and added gauze and some Dusty Attic chipboard honey comb shapes. I spread some texture paste over the chipboard shapes and misted them. For the Love title, I also added glossy accent. For all the mixed media paper pages in the album, I sprayed afew mists on my craft sheet and simply drag the paper through them to create the background. 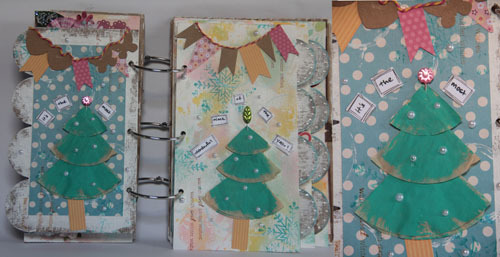 For the chipboard pages, I spread gesso through for the background. 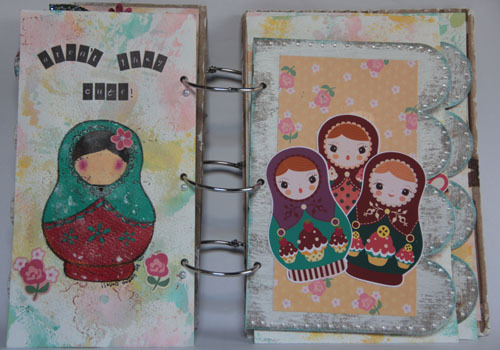 similarly, the chipboard shapes are done by spreading texture paste on them to create the weathered look. For this page, I made the butterfly folding the doily in half and tie with twist tie, then added the butterfly sticker. For the rosette, I used Itop to make the button and adhered to a trim rosette. Added seed beads to the Maya Road leaves. Painted the Dusty Attic butterfly chipboards with gesso and inked the sides with distress ink and added the swaroski crystals. I loved trees. They gave me a calming effect. Trees always remind me of God's creativity and His loving care and His ever-presence. And I love Christmas because its Lord Jesus' birthday!! So definitely I love Christmas trees!!! I made the trees by folding the 3 sizes of cupcake liners into quarter and painting them with green acrylic paint before layering them. Added the Maya Road pins as the "star" of the Christmas trees. Made the banners with both My Little Shoebox and Maya Road banners. This is one of my favourite page!! I love the cuteness and roundness of Russian dolls. The doll on the right is hand drawn and painted with acrylic paints. For the face, I used a circle punch on MLS paper and painted the hair with Faber Castell Pitt Artist Pens and the face and cheek colours with Faber Castell Gelatoes. The dolls on the left are digital images. 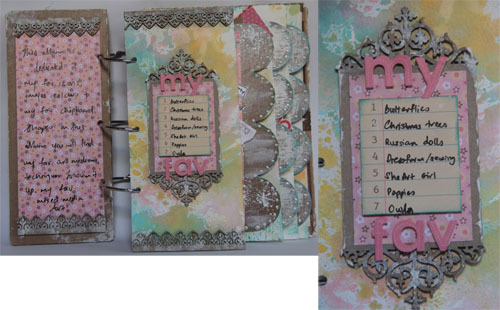 For this page, I used MLS Sew Cute collection and Prima canvas tag and stamp. Dress form is my all time favourite and weakness!!! Every time I see dress form products, I couldn't resist and end up buying them. For the canvas tag, I inked a snowflake stencil with distress ink and layered the cut elements from MLS. I added twines to the spools. The white with purple design dress form was drawn by my Silhouette Cameo. Loved the details on that dress form but it took quite a while for Cameo to draw it out. 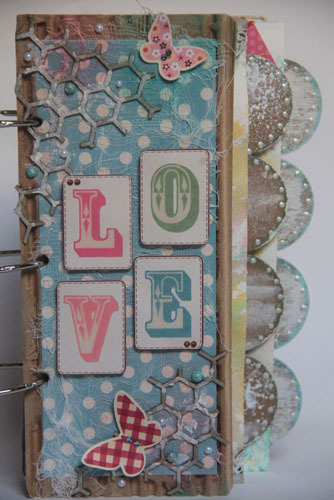 The Love stickers are just the perfect title for this chipboard page as it fit just right on the scallop edge. This is another favourite page. She Art girl is like the "in" thing for mixed media project now. So how could I not be mesmerized by them?? Loved Christy Tomlinson's designs!! 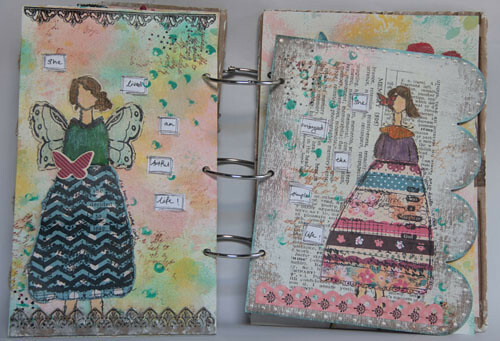 I stamped the She Art Girls twice, on the plain MLS paper and on the patterned paper (for the skirt). Coloured the face and upper body with Faber Castell Big Brush Pens and Pitt Artist Pens and Gelatoes. This is my top favourite page for this album!! Not only do I love poppies like Donna Downey, I also love the labels on each poppy. 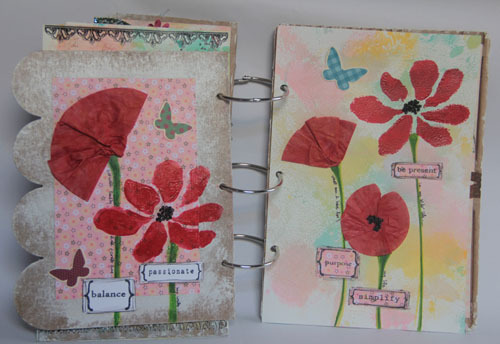 Those are stamped with Christy Tomlinson's My Living Canvas stamps. I also jounal on the side of each stalk the things I want to achieve or take note for each label. This is like a life's journal to me. To create the poppies, I painted the cupcale liners with Faber Castell Big Brush Pens and added water to spread the colour, then fold in half and crumbled them. For the stamped poppies, I used Donna Downey foam stamp with acrylic paint and also added black beads to the flower center. For this last page, it seems like an unfinished page. I wanted to do more journalling all over the page in the first place. But after staring at it for few days, decided to leave the background blank. I might add to it in the later months. But for now, its a finished page to me. Not sure you recognise the species but these are owls!! My hubby said it look like birds. 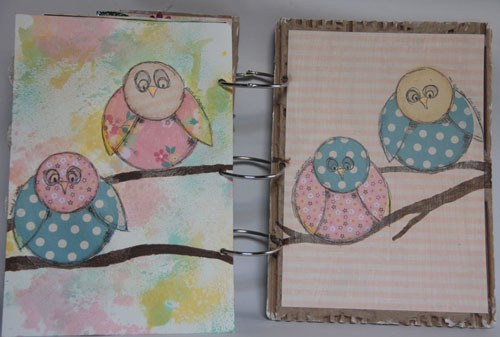 ha ha...These owls are done by layering two sizes of circle punch-outs. Drew the branches with Faber Castell Pitt Artist Pens. Do try your hands on mixed media. It's fun and addictive and also therapeutic. It really take the stress out of me. Thats all for today. Have tons of fun. Thanks for dropping by. Do check out my 4th Blog Candy.